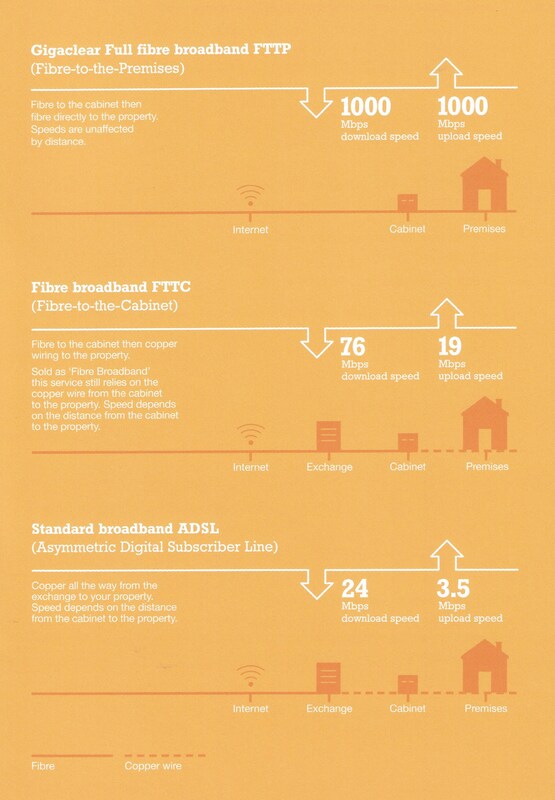 The diagram below shows the expected speed difference between the different type of broadband and explains some of the terminology frequently used. Gigaclaer have provided us with this map of the rollout within our parish. If you would like more details of when the works will be taking place in your street, you can use the following link “https://northsomerset.roadworks.org”, zoom in on your area and in the box at the top right corner of the screen selecting works within the next year. We have met with the overall project manager for our parish, Dan Longworthy-Smith. If you have questions about the route Gigaclear are taking, you are welcome to email Dan at “dan.langworthy-smith@gigaclear.com". Dan spends much of his time on the and and in meetings so if you would like to talk to Gigaclear about any aspect of the rollout in our area, please call Lauren Goddard on 01865 591153. Lauren is based in Gigaclear HQ and has electronic access to all of the route maps for our parish. The government have provided funds to improve rural broadband. In North Somerset this cash has been given to an organisation called ‘Connecting Devon and Somerset’ (https://www.connectingdevonandsomerset.co.uk), they in turn have awarded the contract to install the network in our area to Gigaclear. They will be building the network in Wraxall & Failand this summer. 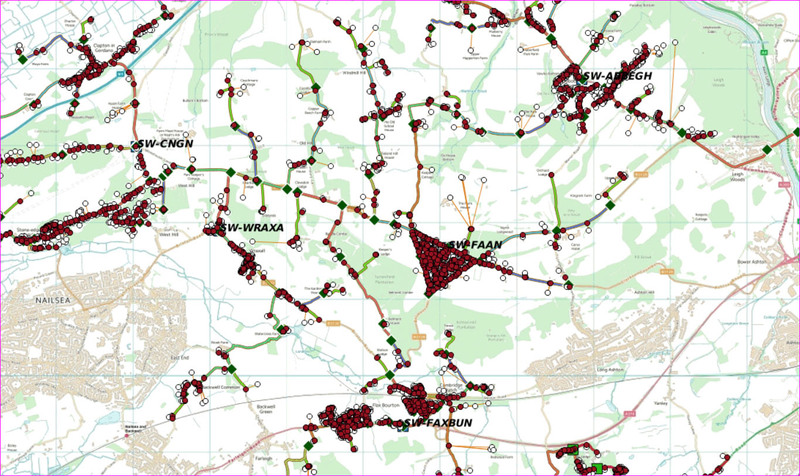 You can find a little more information on the Gigaclear website "https://www.gigaclear.com/postcode-checker/connectingdevonandsomerset”. You can also see the work in Wraxall & Failand by taking a look at this link "https://northsomerset.roadworks.org”, zooming in on your area and in the box at the top right corner of the screen selecting works within the next year. The parish council have been contacted by a number of Failand residents complaining of poor quality broadband services. Today there are two lines between the Long Ashton exchange and the road side cabinet at the junction of Clevedon Rd and Beggar Bush Lane. One of the lines is of good quality and delivers a broadband speed to the customers connected to it of between 2 and 5 Mb/s. This is sufficient for applications such as BBC iPlayer to be able to stream programs in real time. The second line is much older and is of a lower quality. Customers connected to this line appear to be getting between 1 and 1.5 Mb/s. While this is OK for email and web browsing it is not sufficient speed to stream video. Over time OpenReach have moved as many broadband customers as possible to the new line and moved voice only customers to the old line. The new line is now full. There is a government funded project called ‘Connecting Devon & Somerset’ that is working to improve the quality or rural broadband. From their current plans it looks like Failand will not be surveyed for an upgrade before 2016. You can find full details of the ‘Connecting Devon & Somerset’ project at the following link. "http://www.connectingdevonandsomerset.co.uk"
The parish council have discussed the problem and would like to see what we can do to improve the situation. The first step is to find out how many households are affected: If you feel you have a poor broadband service, please email the Parish Clerk under the ‘CONTACT US’ section of this website letting us know the current broadband speed at your location. You can find this out by running the speed test on the ‘Connecting Devon & Somerset’ website, in the section titled ‘Faster Broadband for Home’. To be kept up to date on progress please register your email address on the homepage of this website and tick the box ‘I want updates on, Failand Broadband’. We will be contacting OpenReach, the division of BT that owns the lines to Failand to ensure that they are aware of the problems and endeavouring to bring forward the proposed survey work. To date, twelve Failand households have contacted us regarding slow or non-existent broadband services in Failand. We believe many more homes are affected. If you are aware of friends or neighbours who are having difficulty with their broadband connection please encourage them to get in touch. The more people we have contact with the greater the chance we have of getting some action. The North Somerset Times published an article in September on the broadband problems in Failand. This was useful in raising awareness of the problem and a number of people did get in touch with the Parish Council as a result of reading the article. However the journalist incorrectly stated that Failand is already connected by a fibre optic cable. This is not the case. There are two cables connecting Failand to the Long Ashton exchange one old and of low quality, one newer and of better quality. as detailed above. The end of the programme means that Failand will not be surveyed until late 2016. As part of the ‘Connecting Devon & Somerset’ programme a number of digital champions are being appointed to become involved with the project and help to coordinate local activities we have applied on behalf of the Parish Council to become a digital champion. Have you registered and interest with BT? If not go to the following link “http://www.productsandservices.bt.com/products/broadband/infinity” and use your postcode to register an interest in receiving the service. This is one of the tools BT uses to access the demand in an area and prioritise work. The Parish Council have continued to lobby for an improvement in the broadband capacity for the Failand triangle. This has been through our contacts at the Connecting Devon & Somerset project and via our local MP, Dr Liam Fox. You recently copied the Parish Council on a letter you received from Tim O’Sullivan at BT following a meeting held at their offices to discuss Broadband roll out in your constituency. Tim’s reply was simply a re-stating of the current BT / OpenReach position and contained no new information or any change in BT’s plans as a result of your meeting. We discussed the matter at our last Parish Council meeting and feel strongly that a response is required. We would be most grateful if you could respond to Tim O’Sullivan having considered the issues below. We do not believe Tim understands the amount of effort that residents of Failand have put into obtaining a broadband connection or the level of frustration they feel towards BT / OpenReach. It is simply not acceptable that homes within five miles of the centre of Bristol are unable to get a Broadband service due to the poor quality of the OpenReach infrastructure. Further, to be told that the problem will not be looked at until April to September 2016 and then following that, plans may be drawn up is particularly frustrating. The problem clearly rests with BT / OpenReach. There are two cables connection the settlement of Failand to the Long Ashton exchange. The first has approximately 300 pairs, this cable is not of sufficient quality to maintain an ADSL connection even at the road side distribution cabinet. This has been confirmed by numerous OpenReach engineer visits. The second cable consists of approximately 200 pairs. This cable will support ADSL up to 5 Mbs at the roadside cabinet. However the cables from the roadside cabinet to individual households are frequently poor, in many cases aluminium. The result is typical broadband speeds of 0.2 to 1 Mbs at the master socket within the property. Abysmal communication between ISPs and Openreach has often compounded the difficulty households experience. There is no effective way for households to lodge complaints against BT / OpenReach directly. Even when their engineers provide incorrect information or repeatedly fail to turn up for appointments. Our experience with Connecting Devon and Somerset has been poor. Communication has been subcontracted to a third party and there is no effective way for a body such as the Parish Council to interface to the core project team. In summary we have a community of some 320 homes in Failand receiving an appalling service with no prospect of improvement in the next two years despite the additional funds the government have injected. We would like to see BT / OpenReach appoint a representative whom, armed with the facts can provide an effective interface to the Parish Council to discuss the problem. Subsequently we would like to agree a plan of action to improve the service. Wraxall & Failand Parish Council. BT have responded positively and we are due to meet shortly. We will provide an update once the meeting has taken place. Members of the Parish Council met with Lauren Boon the head of Connecting Devon & Somerset in May this year and have subsequently met with a number of BT and Openreach managers to press the case for accelerating the connection of Failand to the Openreach fibre network. The published dates are for the survey to be undertaken in September 2016 and the build works to take approximately nine months following that. This schedule has been considerably advanced. We received conformation to communicate yesterday. The Failand survey has been commissioned and the work undertaken by the communications consultancy Harlequin. The survey and the network design for the Failand are now complete. Fibre duct, a plastic tube that will eventually carry the fibre has been installed in Long ashton and along the Clevedon Road in Failand. Once this is in place the fibre cable itself is ‘blown’ along the tube with compressed air, a relatively quick process. There is still a missing section along Providence Lane, the roadside ducts are blocked in a number of places. Road closures for Providence Lane have been scheduled for mid January to allow the work to clear the ducts to be undertaken. If the work to clear the ducts is successful, a new DSLAM communications cabinet will be installed in Failand next to the existing cabinet at the junction of Begger Bush Lane. Then the existing lines that come from your house will be mapped from the current cabinet across to the DSLAM making the current analogue cables to Long Ashton redundant. The DSLAM is a device that takes the analogue signal that comes from your house and converts it to a digital signal suitable for passing over the fibre. The fibre will connect not to the Long Ashton exchange but through the exchange to Bedminster where Openreach have a major hub. Customers connected to the DSLAM can expect speeds in excess of 10 Mb/s. All work is scheduled to be complete by the end of Spring next year, however this date very much depends on the success of the work in January along Providence Lane. So if you see a BT van by the side of the road, be nice to them, take them tea! Bake a cake, let’s keep them happy, they are working hard to bring you better broadband. We are happy to report that works are currently taking place to install the DSLAM cabinet that will bring fibre broadband to Failand. If all goes well we will see a new cabinet appear alongside the existing communication cabinet on the Clevedon Rd close to the Beggar Bush Lane traffic lights. If you see the OpenReach staff, please make them welcome. Following the groundworks it will take some time to map the connections from each home from the existing cabinet to the new one. This work may take up to three months. Last week the new communications cabinet close to the traffic lights on the Clevedon Road went live. Connecting via this cabinet will remove the problems associated with the old lines to the Long Ashton exchange (see above) and deliver significantly better broadband speeds. How much better? No one knows… If you live right next to the cabinet you will get a fantastic service, 70 to 80 Mbps has been quoted. Further away and through poor lines, the speed will decline sharply. Almost everyone in Failand should expect at least 8-10 Mbps. To connect your home to the new cabinet, you must subscribe to a Fibre Broadband service. As people take up the fibre service, this will free up pairs on the newer analogue line between Long Ashton and Failand and OpenReach will be able to migrate households from the old to new so eventually everyone will benefit.